Also using a few stamps and or pieces of... from Quietfire Design. Absolutely stunning Yogi. Love all the embellies especially the bow :)Thank you for playing along with us at DigiStamps4Joy and we hope to see you again. Going to try this again! This is fabulous! So glad you were inspired by this week's challenge at Cupcake Inspirations! Thanks for playing with us at C.R.A.F.T. Challenge this week! What a nice design Yogi, thanks so much for sharing with us at Allsorts challenge this week. This is a wonderful creation. I love all the embellies you used. And the pop of colour is just lovely. Hi Yogi - this is superb! Not only is the background amazing but the spray of embellishments is perfect. This is the second card in as many days that I have really wanted to touch because of the textures. Just gorgeous. Thank you so much for joining us at the OSAAT challenge this week, lots of luck to you. 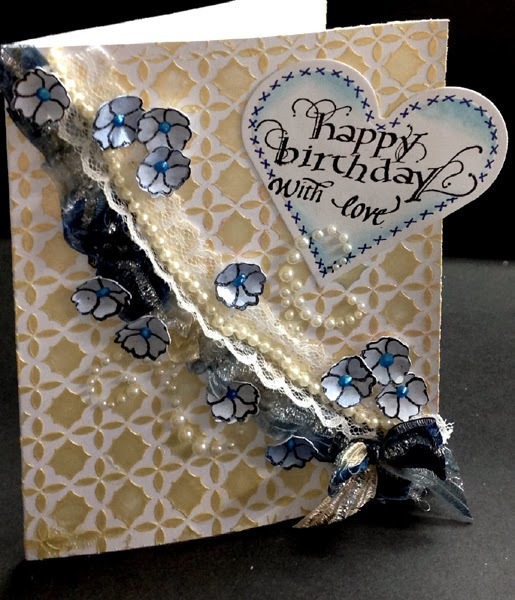 Oh Yogi, this card is ftooo beautiful for words - you've created such wonderful texture in your amazing background anf the shades of blue are wonderful with the shades of white. I wish I was holing this stunning card rather than viewing it on a computer screen. I love seeing your cards because they truly are wonderful works of art that never cease to leave me in awe of your creativity. This is a lovely project, Thank you so much for sharing with us at Allsorts and joining our challenge this week. Thanks for joining us at RRR. Hope to see you again. Beautiful colour combo, love the background and all the embellies make it extra special! Thank you so much for joining us over at Premium Crafts Brand and good luck. Love the textures you've used to add another dimension of interest in your creation! Thanks for joining us at One Stitch At A Time, hope to see you again soon. This is so pretty! Love the lace and pearls. And the cute little flowers. Yogi I love design of your card, its beautiful. Thanks for playing at OSAAT. Very pretty card!! Thank you so much for joining us at 4 Crafty Chicks this week for our bling challenge!! What a beautiful card. I really like the layout and the blue hues on the card are really pretty. Thank you for joining us at OSAAT challenge. This is a very pretty card. Thanks for playing with us at Cupcake Inspiration Challenges this week! So gorgeous card. Love the design. Thank you for playig us at Incy Wincy Challenge!